Al Gini argues that no matter what any politician promises, taxes are not going down. So what’s a citizen to do? Historically, the truth of the matter is that all governments, large and small, are forced to tax their subjects; and many of these taxes have been so absorbent that they precipitated dissent, riot, and, on occasion, revolution. Nevertheless, taxes are the lifeblood, the fuel, the energy of a nation. It is the means by which governments pay their bills and offers their citizens services, perks and benefits. Without taxes, governments, good or bad, tend to fail. Although historians and CPAs tell us that federal taxes have been higher in previous years, the burden of taxation on the individual citizen seems excessive, not just because of the federal income tax, but because of the sum total of taxing bodies to which we’re subjected. Individual earners making less than $18,000 a year and families of four earning less than $24,000 are not subject to taxes. Lower middle class, dual income households pay about 10% of their income. Middle-middle class, dual income households pay about 15 to 25% of their income. Upper-middle class, dual income households pay about 28 to 33% of their income. The “super” wealthy pay 35% and more of their income. Now, all things considered, this schedule of federal taxes seems doable and manageable. 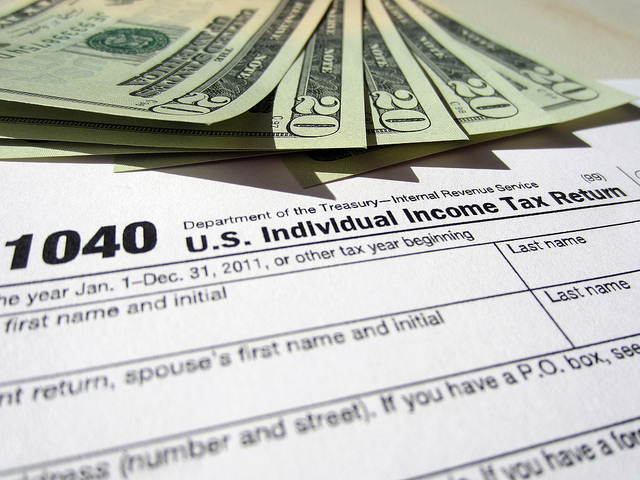 Unfortunately, the average American’s vulnerability to taxes does not stop here. Using a dual income, home-owning family as our model, added to the federal tax bill are the local real estate tax, state income tax (5 to 7% per annum) and various county and city sales taxes (7 to 11% per purchase). In effect, what this means is that individual families in the middle-middle class and above can pay in excess of 45% of their gross income in various taxes! If you’re not depressed yet, there’s also this: Like the continuous rise in the cost of gasoline, you ain’t seen nothing yet! Since 9/11, the war on terrorism, the wars in Iraq and Afghanistan and the general needs of the military have skyrocketed. Add to that inflation, the needs of the “baby boomer” generation, the Great Recession and an unemployment rate finally down to 8.3% from a high of 9.5%, and I can promise you that federal taxes are not going down. At the state level, infrastructure is falling apart: Every state needs new roads, better bridges, etc. etc. Every city needs to improve their schools, develop public transportation and keep the streets clean. So, bottom line is, no matter what any politician promises, taxes are not going down. So what’s a citizen to do? Frankly, I’m no longer sure. Taxes are supposed to be a “social engineering device.” They are supposed to pay for things that individuals cannot or will not be able to pay for or provide for themselves: e.g. schools, highways, police and fire departments. Do we, as a society, now suddenly decide not to pay for schools, police or Medicare? This, I think, would be even more unacceptable to most of us than simply paying our taxes, no matter how high. In the end, I think my father-in-law had it right when he said that he hated paying taxes, but he loved this country. And so, he paid his taxes, because you couldn’t have one without the other.